Giving Gladly: What's it like to give half? Blessings to you and your husband for your example of living within your means and being intentional with your finances! Julia, you guys are really cool. Thank you for sharing this! Thanks for this post, which I find inspiring. Every year I struggle to find the right budget balance between my three big goals: donations, saving for retirement, and paying off our mortgage. You have the advantage of having started all this when you were young; I'm way behind on saving for retirement (at this point I could fully retire by my early 80s without running out of money before I die, or partially retire by my mid 70s), and we want to pay off our mortgage before we reach retirement age (we're in our 50s). So I have to balance those goals against our annual donations. That's hard to do. We live on a little more than 1/4 of our combined household income, with the remaining 75% parcelled out across those three goals. I find it hard to strike a balance that makes me happy: if I contribute more to the future me (retirement), I feel more secure but also more selfish, because I know most people in the world never have the luxury of "retirement" and I could donate more if I resolve to keep working through my 70s (I actually do intend to keep working part-time as long as I can, but I don't want to keep up my current pace of work). Similarly, if I slowed down our progress on paying the mortgage I could donate more, but on the other hand the sooner we pay off the house, the more I'll be able to put toward donations. Why don't you get taxes exemptions for your donations? We do. We would pay more in taxes if we didn't donate. Julia, I am currently in a Philosophy Class in which you were a guest speaker. I really like your visuals. I live in California where the cost of living is significantly higher. My one bedroom apartment is $1250 a month. My pension is $3200 a month, out of which $750 is automatically deducted for health insurance. I have no debt now which is truely a blessing but it extremely difficult to live on this amount - let alone give large percentages. I have eliminated Cable, TV, nails, things I want but don't need, etc. Does giving at your church or donating things in the community count as the type of giving you are discussing? I would love the opportunity to talk or chat more with you as to how to give more. I do intend on taking my current pension and break it into an expense chart as you have done here. I was very motivated by you comments in my Princeton Online Philosophy class as well as on this page! It sounds like your housing prices are pretty similar to Boston - $1250 is below market rate for a one-bedroom here. Jeff and I have either shared apartments or lived in a studio (preferring to share space, which lets us share other people's company as well as cooking and other chores.) It does sound like your insurance is a good bit more than ours would be, though. As to what to count as donations, that's a good question. 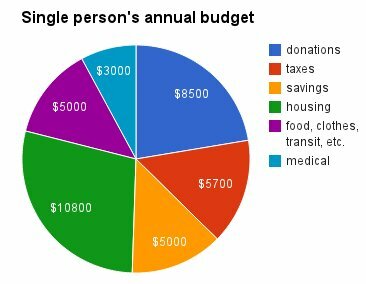 When I make my budget, I have a "giving" category that I set aside for the best opportunities I can find to help other people. That usually means something in the developing world, where money goes a lot farther - I look to GiveWell.org for recommendations as to the best organizations. For things like church and community donations, I count that as personal spending, so it does not come from my "donations" budget. If I give to my public radio station or a friend's fundraiser, I consider that more like dues for a service I use or a way of strengthening friendships, so I count it as spending on myself rather than helping others in the best possible way. I think different budgets work for different people, and I'm sure my method wouldn't work for everyone. But breaking down your expenses to see where it all goes sounds like a great way to start. If you have more you'd like to discuss, feel free to email me: julia.d.wise@gmail.com. In 2014 your husband's website lists income at ~$255k. 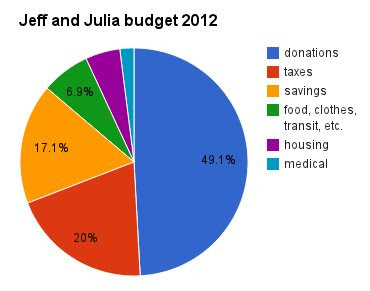 Since you have retained your half-donations pie slice, I'm wondering how you're allotting the extra ~$77k? Savings. We're in the process of buying a house, so it basically went there. The corresponding link in the favorite posts sidebar is taking to objections to giving instead. Great thing to do - I hope to aspire to become an effective altruist like you guys!